What energy democracy means and the benefits of local, community control of energy resources. What Community Choice energy is and how a Community Choice energy program, as a public alternative to an investor-owned utility, can be the vehicle for energy democracy, if the community is organized and demands it! How low income communities and communities of color can benefit from a Community Choice energy program that focuses on local clean energy resources and equitable economic development. For Bay Area cities like Oakland in the midst of a housing crisis, with displacement and homelessness at an all-time high, developing local clean energy resources does not just mean climate resiliency and community control, but also equitable economic development and good local jobs so residents can afford to stay in their neighborhoods and benefit from future developments of local clean energy. Mario Balcita, staff Youth Coordinator at HOPE Collaborative made connections between energy democracy and the work that the youth currently do with neighborhood planning and food security. One of HOPE’s projects is the Healthy Corner Store Initiative where they partner with corner stores in the Elmhurst area in East Oakland to provide healthy food options for the community. Much like creating opportunities to buy healthy food in ‘food deserts’--areas with no access to fresh, healthy food or health food stores--a Community Choice Energy program can bring local clean energy resources into communities that have historically been treated as dumpsites by companies generating or utilizing dirty energy from oil refineries, power plants, and incineration. 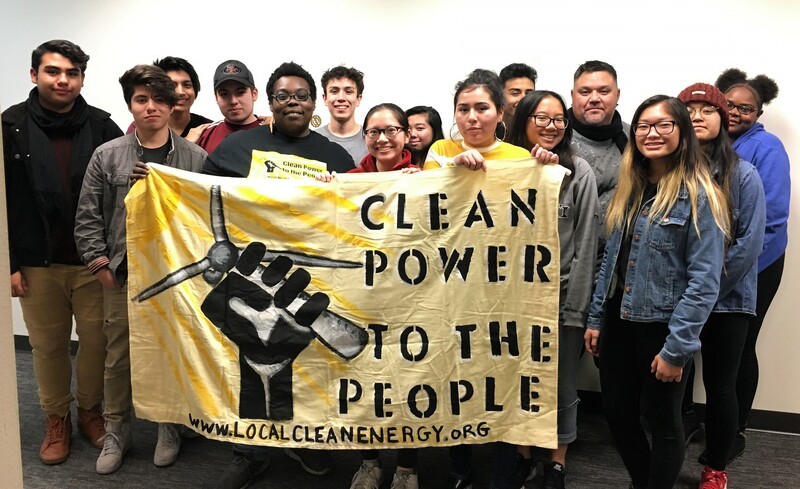 A public energy program that prioritizes local clean energy jobs and community benefits can bring even more HOPE to the youth of East Oakland.